Share the post "1601 S. Winnebago St."
From early morning, it seemed as though I was running in high gear since before I even reached the front door of my office. The early days of the week were quieter, but these last days have been full speed ahead. We all were hoping for far more rain than we received today. I’m not sure what direction our summer is headed, but if we don’t get more moisture, we’re going to have some pretty water-starved flowers and vegetables. I can’t believe how quickly the soil has dried. This afternoon while walking a small portion of a field, I noticed an interesting rock, so I picked it up so to examine it. Wow! It was almost too hot to hold from the heat it had absorbed from the sun. It caused me to think I was walking on scorched earth. The stone was interesting enough to where I decided to keep it and add it to my little collection of odd looking rocks. Just before I left for my late morning appointment, I happened to notice a youngish woman across the street walking down the sidewalk with a cell phone glued to her ear. I was forced to look twice because of my disbelief of what I had noticed. Oh Mercy! That woman must’ve wanted every man either driving by, or walking past, to see the beyond skin-tight leotard-looking long-legged stretch pants she had on. To make matters worse, she was wearing a rather revealing sleeveless top that only came down to her waist. She left nothing for one’s imagination. That spectacle brought back to mind the time I was walking in a desert and happened up camel tracks. After confirming what I thought I saw, I shook my head and walked away with another confirmation that we are indeed living in the generation of “look at me”. I’m beginning to wonder when the general public is going to stop riding this wave of sensationalism. Facebook, along with all the other social medias continue to fuel this craze. Every time I see where someone has snapped a “selfie” and posts it all over the internet, I think, “Do you really have so little self respect that you have to degrade yourself to such levels and share it with millions?” Seems far too many are doing anything they can to get noticed–even if it’s in a bad light. Part of my day was spent listing an acreage just outside Lake Mills. 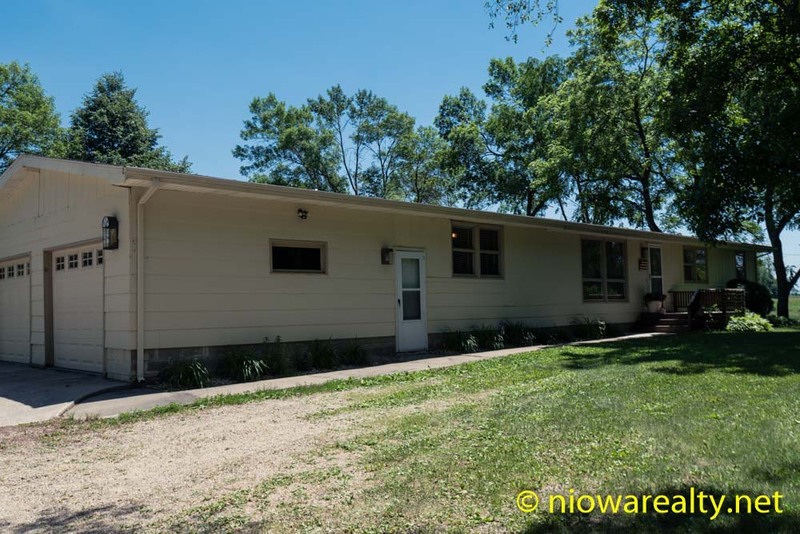 It’s located at 1601 S. Winnebago Street and is a one-owner over-sized 4 bedroom ranch that’s had some good updates including a Fieldstone kitchen. What I found the most appealing about it was the fact that all four bedrooms, laundry room and half bath are on the main floor. The basement has a rec room, a office/den, and a shower room. There’s an over-sized storage building at the rear which could be a place to raise chickens or a few goats. There are some very nice hardwood trees on the site which help to give the site more of a country ambiance. I’ll make a great home for a young couple with children. The above photo is one of the exterior shots. Click on the following link to view more. Please be sure to make a note of my public open house tomorrow that’s located at 2831 – 4th St. NW here in Mason City. It is definitely the pride of the Sunrise Ridge area, and if you’re up for a short drive, take a road trip to my new listing at 1601 S. Winnebago St. in Lake Mills. And by the way, it’s only a very short distance from Rice Lake.